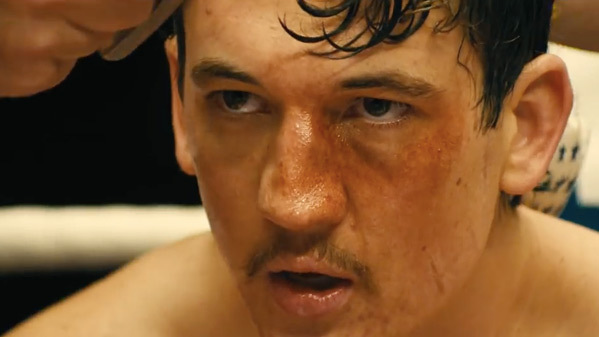 "I don't mind the pain…" A new UK trailer has arrived for boxing drama Bleed For This, starring talented young actor Miles Teller as World Champion Boxer Vinny Pazienza. Paz started to rise in the boxing world in the early 90s, winning the junior middleweight world title, but broke his neck in a serious car accident. Doctors told him he may never walk again, but Paz returned to the ring thirteen months after the accident and made one of the greatest comebacks in the history of boxing. The cast includes Katey Sagal, Ciarán Hinds, Aaron Eckhart, Ted Levine, Kimberly Howe and Amanda Clayton. Both Teller and Eckhart give fantastic performances in this powerful story of overcoming hardship and fighting to do what you love. The inspirational story of World Champion Boxer Vinny Pazienza (Miles Teller), who after a near fatal car crash, which left him not knowing if he'd ever walk again, made one of sports most incredible comebacks. Bleed For This is both written and directed by American filmmaker Ben Younger, of the films Prime and Boiler Room previously. The screenplay is by Younger, from a story by Pippa Bianco. This has yet to play at any film festivals or otherwise but may show up somewhere later on. Open Road Films will release Bleed For This in select theaters starting November 18th this fall, with a wide release after. Planning to watch this? Looks good. Teller's mustache is interesting. Saw this at TIFF. I liked it more than I thought. It was funny, sad and the cast did a great job. It could've done more to stand out though, since it felt cliche.